3/01/2011 - There's a fairly popular trope on amateur design forums of creatures that become planeswalkers. Usually it's done with flip cards, but sometimes level-up or other means. The trouble is that, ultimately, none of the solutions are really good. 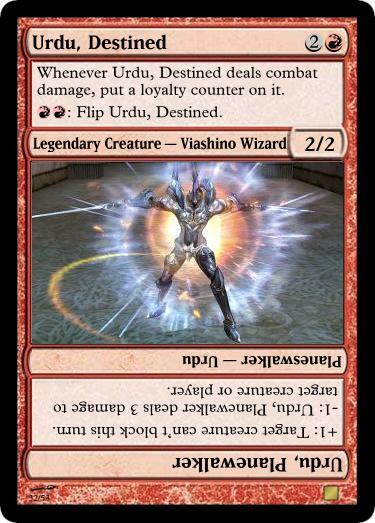 A flip planeswalker has room for two simple abilities at best. A level-up walker is basically unreadable, even with just two levels. 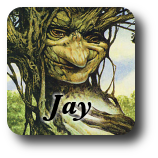 A replace-via-search method like today's Jared, Adept has the problem of naming another specific card which has never been a resounding success for Wizards. I don't believe any of these are printable, though Jared's method is at least worth considering. See how messy that is? And that's with just one ability! So why do people continue to try? Because it's an awesome idea. What more dramatic single-person event can we witness than a mortal's spark erupting? Death happens all the time in this game. Birth—well, unless we're talking about the Messiah—who cares about a baby? Coming of Age? Marriage? Shooting a three-pointer from clear across the court? These all kind of pale in comparison to the puts-on-sunglasses-YEEEEEAAAAH moment of realizing you have unlimited potential and the multiverse itself is your sandbox. Why does Jared not become a Planeswalker if he eats a Doom Blade? Why does a wizard have double strike? 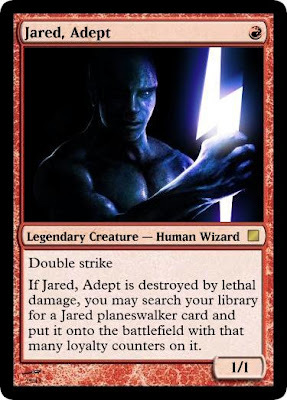 Alternative template for Jared - When Jared is put into a graveyard from the battlefield, you may search your library for a Jared Planeswalker card and put it onto the battlefield with loyalty equal to the damage dealt to Jared this turn. That really seems more like a White ability, though - the Red Jared should want to deal damage, not take it. How about: "2RR. 2/2 doublestrike. When Jared deals combat damage, you may sacrifice it. If you do, search your library for a Jared Planeswalker card and put it onto the battlefield with loyalty equal to the damage it dealt this turn." Maybe that's getting too clever, but now doublestrike has a lot of interactions with the ability. 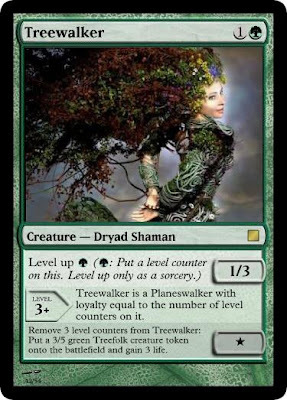 Treewalker doesn't function as worded; level counters won't be removed by damage. Being able to pay mana for loyalty also seems a little off. This Wizard has double strike because his magic projects the pain he's about to cause you ahead of itself. Magic's Magic, y'know? Another fun but extremely unlikely solution is to print a planeswalker token and have the walker-to-be put it onto the battlefield.